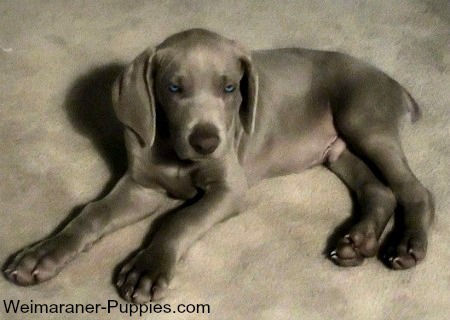 Home→New Weimaraner Puppy→What is the Best Puppy Age? What is the Best Puppy Age? 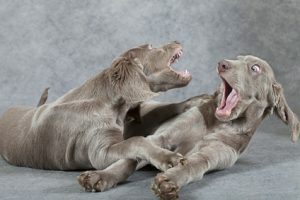 The puppy age for separating a Weimaraner puppy from its siblings is no longer what it used to be, and you might be surprised to know the current thinking. Knowing exactly when to bring home a new puppy, can make a big difference in how your new puppy adjusts to your family and to your home. To give your Weimaraner puppy a healthy start to life, he needs to stay with his mother and brothers and sisters for the first few weeks of his life. 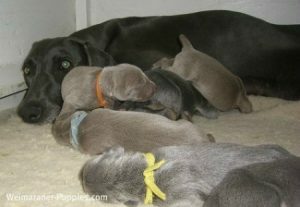 This cute Weimaraner puppy may not be quite at the best puppy age to leave Mom. Puppies are born absolutely helpless. They are blind at birth and their eyes and ears are closed. For about 2 weeks, all they do is eat (nurse), sleep and occasionally crawl all over their mother and brothers and sisters. Gradually puppies start to become aware of their world. Young puppies start to hear sounds around them. And soon they start to see light, then objects. 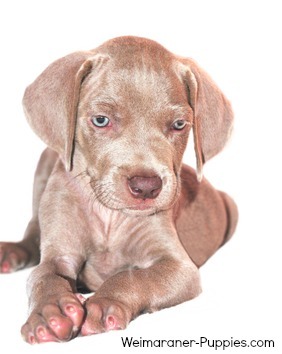 Weimaraner puppies learn to be dominant or submissive with their litter mates. Puppies stay awake longer, and they play with their siblings. And at an early age, puppies start to show their dog personalities—wagging tails, yipping, yelping and poking at mom and the other pups. At seven weeks, a puppy has formed his personality. From about 2 weeks to 14 weeks of age is “critical”—it’s actually referred to as the critical behavior period. During this time a young Weimaraner dog learns how to behave with his mom, his brothers and sisters and, to a limited extent, with people. A Weimaraner puppy learns how to relate to other dogs and learns “pack manners”. Mom plays a very important part in this education. At this age, a dog learns his place in his “pack”—whether he will be a dominant or a submissive personality. 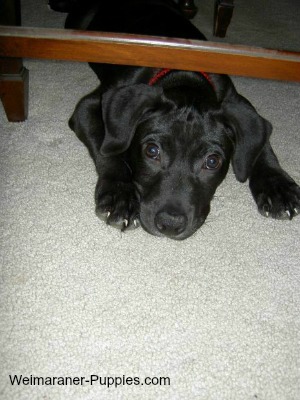 Most experts believe that a puppy should leave his litter for his new home, when he is between six and eight weeks old. Some say that exactly 49 days is the best time for him to leave the litter. While the exact timing is not critical, there are some things to consider. A puppy that is too young may miss out on important learning from his mother and his litter mates. He won’t know how to relate to other dogs. But, most important, he will not learn how to modify his bite strength. He learns this from playing with his brothers and sisters. A dog who has not learned to soft mouth others may hurt you or your children when playing with you. After puppies reach eight weeks of age, they become more aggressive at combative play. There is a reason for this. Puppies are now developing a ranking order. Some will become dominant personalities and confident. Others will become submissive, and they will not be confident. Personalities at this age start to be irreversible. Dogs have learned their place in the pack, and they act accordingly. Staying too long in the breeder’s kennel also has an effect on puppies. When a puppy stays in the litter over 12 weeks, pack behavior is embedded. 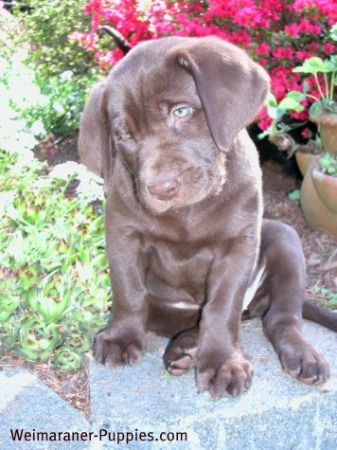 This is more of a problem for shy or submissive dogs, but it does affect all the puppies in the litter. Play fighting helps dogs determine who will be dominant and who will be submissive. Naturally shy dogs end up having low levels of confidence, and they have trouble making independent decisions. Dogs who are dominant become pack leaders within the litter. A pack leader left in the litter past twelve weeks, can be overly aggressive with other dogs and with people. Unfortunately, dogs left in the litter too long do not learn to fully identify with humans. Socialization can help, but these dogs will not bond as well with you and your family. Dogs left in the litter past twelve weeks have missed their best socialization period with humans. They often develop a fear of new situations and environments. They can be overly excitable or overly withdrawn. So, as you can see, it is important to adopt your new puppy when she is not too young and not too old. If you work with a competent Weimaraner breeder, the breeder will help you know when it is the right time. If this is your first dog or puppy, you might appreciate a little help with taking care of your puppy and training him. Doggy Dan has an excellent collection of dog training videos that make training your puppy easy as pie! I’ve used quite a few of his tips with my current dog Skipper. You can access well over 100 of his dog training videos for 3 days for just $1. 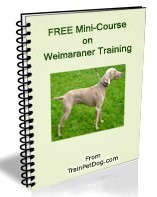 Click here to learn the tricks to easy dog training now.